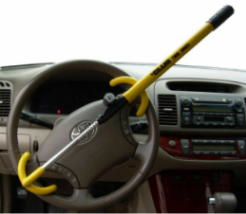 Stop professional thieves and joy riders from taking your vehicle with The Club Twin Hooks. Made in yellow for high visibility, The Club Twin Hooks locks on to the steering wheel, making the vehicle impossible to steer. The concept: "If you can't steer it, you can't steel it". Yellow vinyl finish protects your steering wheel.